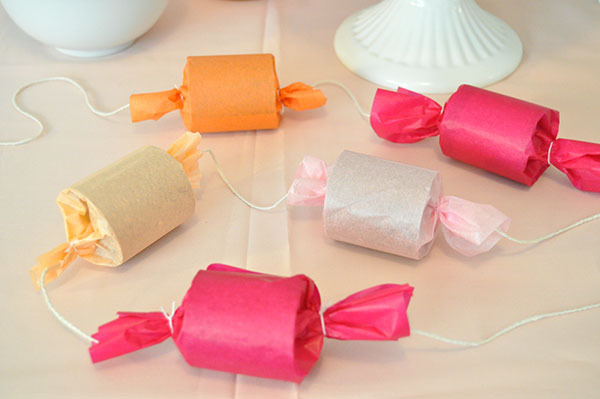 I have a huge sweet tooth, so it is near impossible for me to resist a good candy garland. There have been some really fun ones here on Oh Happy Day in the past too: candy lights garland, cotton candy garland, and jelly bean garland. 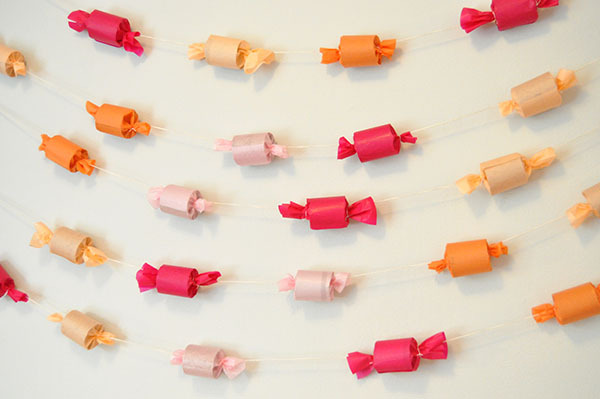 Use any color tissue paper to whip up this sweet little garland for your next party. Supplies: Various colored tissue paper, toilet paper rolls, scissors , string , ruler , glue stick (optional). Step 1: Cut the toilet paper rolls in half. 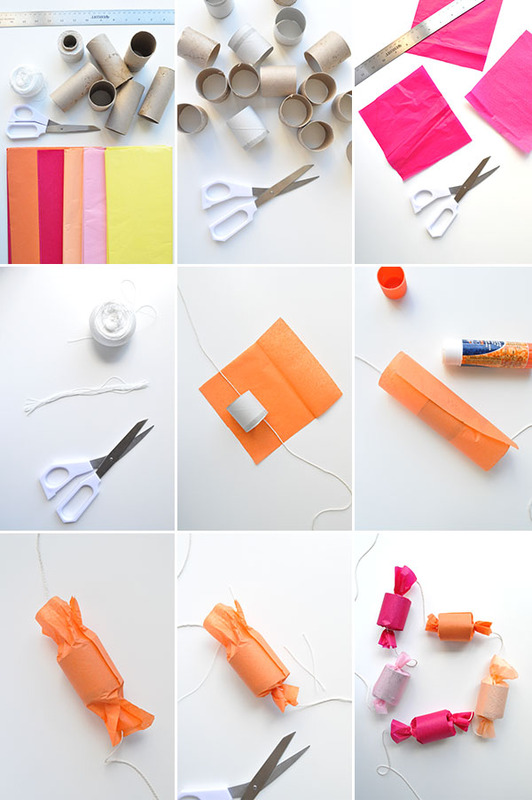 Step 2: Cut pieces of tissue paper into 7″ squares. Step 3: Cut 6″ lengths of the very thin string – you’ll need two pieces for every toilet paper roll. Step 4: Cut a piece of regular string to the length you want the garland to be. Slide a toilet paper roll on like a bead and place a tissue paper square under it. Step 6: Gently gather and crunch the excess tissue paper on both ends. Step 7: Use a piece of thin string to tie each gathered end and cut off any excess string. Step 8: Repeat as many times as desired! I *just* threw a candy party in August. Wish I’d seen this then! This is sooo cute! I will definitively do this in my room! 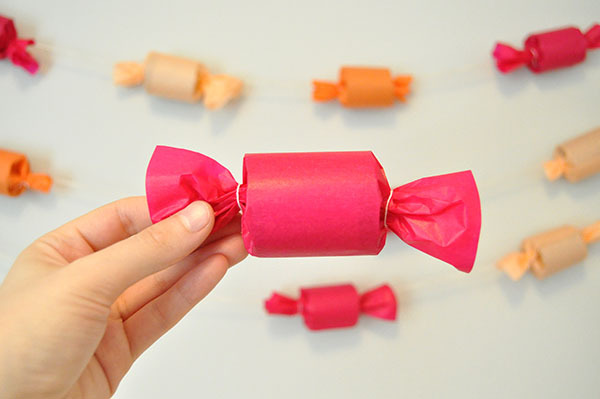 So cute and easy to make! Thanks for posting this! So cute, I’m going to change the colors up a bit and use this DIY for Christmas!!!! Awesome work! 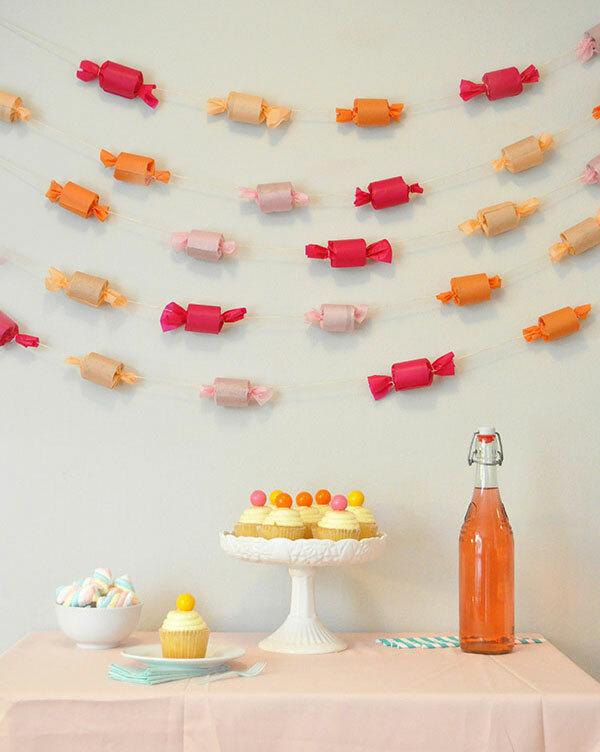 This candy garland looks so cute. And it’s so easy to make. So cute! You always have the best garlands! Lovely! This is so cool! Great decorating idea. I will try it for my nephews birthday party. Thanks for sharing! 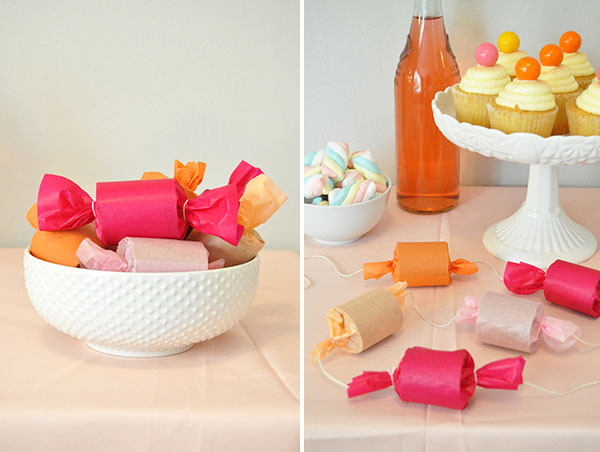 How cute, I love garlands and candy so this is definitely an A+ on my list!